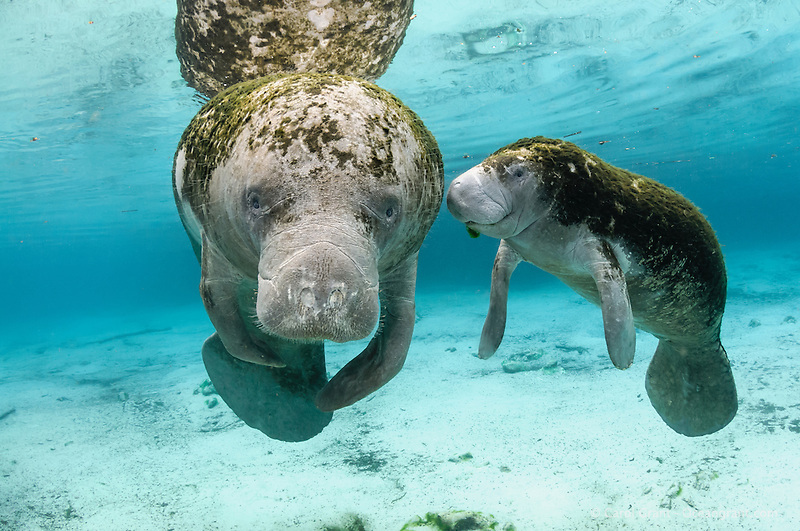 Manatees in March – what is special about this time of the year in the freshwater Florida springs? First, we are very lucky to see manatees in March as if it warms a lot in late February a warm March will beckon manatees to leave the springs and spread out early. If we have a cooler March, the manatees will tend to stick around near the warm springs and this becomes my favorite time of year to see them. The lovely blue spring water seems more abundant in March due to strong sunlight and milder cold fronts. There are more delightful mothers with their young ones out and about too. I find it peaceful in places like Three Sisters Springs during much of March. Yes, Spring Break is upon us, but I don’t go on busy weekends and find that when I do go the manatees have the springs mostly to themselves. Also the Manatee Watch volunteers do a good job supervising in and around the springs. It becomes truly quiet and serene as you will see in this series of photographs.